About frigg'n time! He's had it too good for too long. George is DEAD! Long live George.... or something. There's already a [small stew brewing] about the trailer posted earlier and why the US version of that trailer has a whole segment in which Connor is seen killing Revolutionary forces removed. Check this out. Pretty cool. This along with those recent trailers - good warm up. Picked this up, although I don't think I'll get around to it until much after the "buzz" for it has worn out. Still have ACB and ACR to get through...good problem to have I think. At some point, life's going to have to jump to the back-burner. Still have ACB and ACR to get through...good problem to have I think. At some point, life's going to have to jump to the back-burner. Ubisoft has announced that the first add-on for Assassin's Creed III is available now for Season Pass owners, with The Hidden Secrets Pack adding new single-player missions and outfits, alongside a pair of new multiplayer chatacters. You can grab the ACIII Season Pass for 2400 MSP. Three extra missions, including the Lost Mayan Ruins, the Ghost of War and a Dangerous Secret, for an additional hour of gameplay, taking gamers from the lost Mayan ruins to the high seas. Every successful mission is rewarded with in-game weapons. 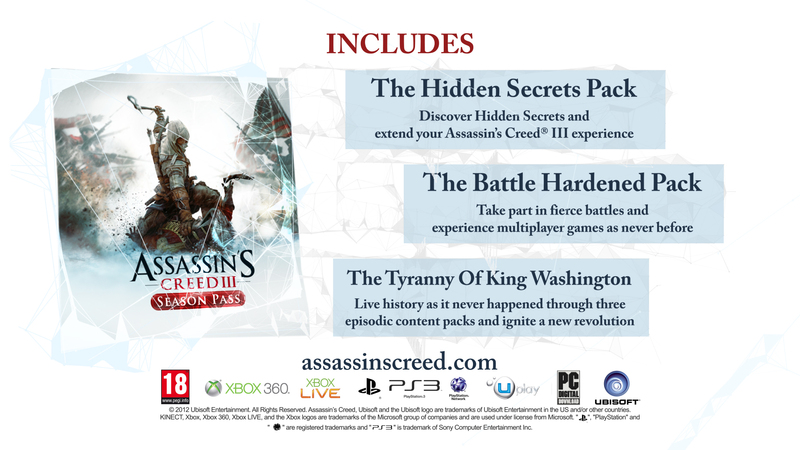 Assassin's Creed III Season Pass owners can grab The Hidden Secrets Pack now, while non-Season Pass people will be able to grab it on December 11th. However, the Season Pass grants a 25% discount on add-ons, including the Tyranny of King Washington, which is scheduled to arrive in early 2013.